UUCR is an inclusive community, welcoming all who enter our church. Unitarian Universalism is a religion based on respect for all people. 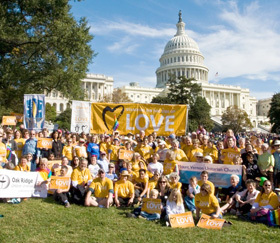 The Welcoming Congregation Program was launched by the Unitarian Universalist Association in 1990 to ensure inclusion of lesbian, gay, bisexual and questioning people within Unitarian Universalism. UUCR became a Welcoming Congregation that same year. To become a designated Welcoming Congregation, a congregation must accomplish an intentional process of education and outreach around LGBTQ issues. UUCR has always been an inclusive religious community, welcoming all who enter our church. As a Welcoming Congregation, UUCR is committed to making sure that lesbian, gay, bisexual, transgender, and queer people are full members of our faith community. Being welcoming means striving for radical inclusion, and creating spaces that honor every part of our identities, backgrounds, and experiences. Include and address the needs of LGBTQ persons at every level of congregational life. Celebrate this diversity by having inclusive language and content in our worship. Fully incorporate the experiences of LGBTQ individuals in all our programs including faith development. Include an affirmation and non-discrimination clause in our Constitution and other official documents. Engage in outreach into the LGBTQ community and actively support LGBTQ groups. Offer congregational and ministerial support for union and memorial services for LGBTQ individuals and their families. Nurture ongoing dialogue between all people regardless of sexual orientation. Affirm and celebrate LGBTQ issues and history during the church year. Celebrate the lives of all people and their ways of expressing their love for one another. For more information about Welcoming Congregations, please visit the Unitarian Universalist Association website.